I remember the afternoon that we discovered that dogs love beer. It was a number of years ago when we lived in Upstate New York. Our family cocker spaniel Lady, who recently passed away at the age of 16, decided that she had to investigate the box the UPS driver had left near her spot in our garage. This had happened before to other packages with food and even make up, but I cannot imagine what went through her mind this time when she ravaged the cardboard only to find a case of beer bottles from a microbrewery inside. Not to be deterred, she bit the caps off at least nine bottles and pried at most of the others before we discovered her beer bash. Lady really did not get to taste much brew that day and now I wish a pair of entrepreneurs on two separate continents had come up with their brainstorms just a little earlier. The news media has been going a little crazy the last day or so over Dutch pet shop owner Terrie Berenden from Zelhem. She has come up with a recipe for a beef extract and malt non-alcoholic brew called Kwispelbier -- or Wagging Tail Beer. It turns out the Dutch treat for canines is not the lead dog when it comes to suds for man's best friend. 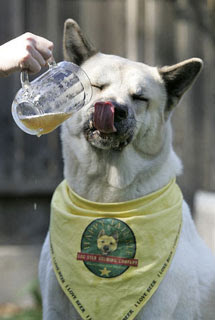 In California, Jamie Miller discovered on a camping trip that her 120 pound Japanese Akita named Kodi loved beer. In 2005, she started brewing and marketing Happy Tail Ale, a beef flavored non-alcoholic brew. You can now get it in a number of states and over the Internet through www.beerfordogs.com. Unfortunately, it's too late for me to share a brew with Lady, but my Daughter and Son-in-Law recently acquired a great dane puppy. So, as soon as I figure out the legal drinking age for a dog in North Carolina, Winston and I are going to sit on the back porch watching the ducks on the lake and enjoy a brew. That could give a whole new meanging to the term, "DUI".